The role of sutures in cosmetic cutaneous surgery is to close a wound and promote healthy wound healing with good cosmetic results. To this end, a variety of suture materials have been developed. Sutures have been used for millennia. While determining which suture to use, we must look at all the characteristics of the suture material. The suture properties include physical characteristics, handling characteristics, and tissue reactivity characteristics. Each of these is interrelated and affects one another. The physical characteristics described include suture diameter (caliber), tensile strength, configuration, knot security, elasticity, and absorption. These characteristics are interrelated to both the handling and tissue reactivity of a given suture. 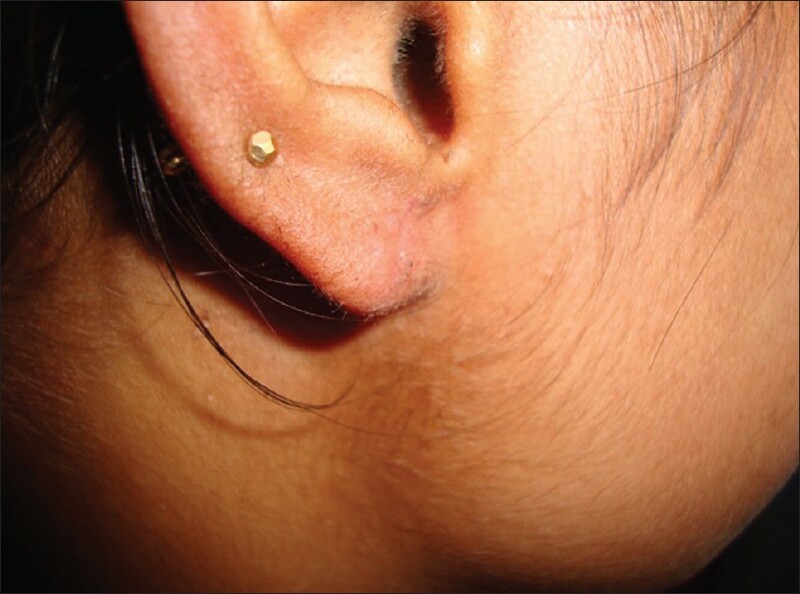 Lobuleplasty is the repair of torn ear lobe. Otoplasty is a general term for ear reshaping. The ears are not only one of the most visible parts of the body, but also very fashionable and make a major statement by how they look and what jewellery a person wear. Many women and men suffer from this problem as they wear jewellery to enhance their appearance. 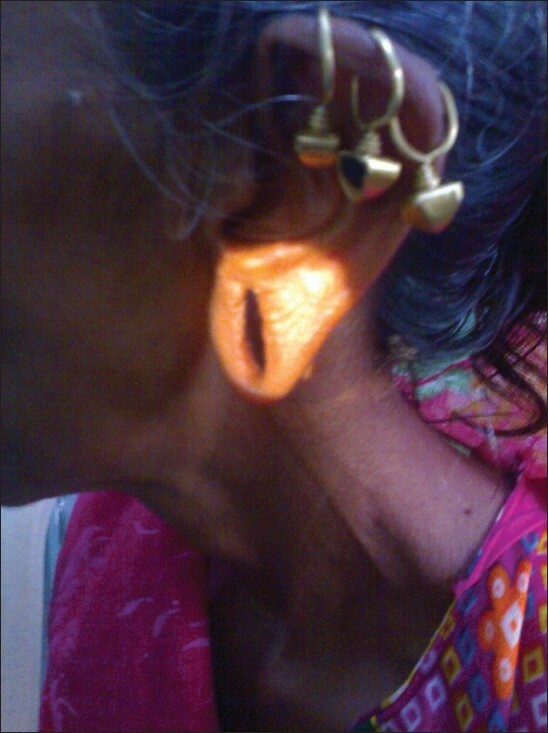 This may be due to the fact that they may wear earrings that are too heavy or hang low. This is not just a problem exclusive to older women. Over a period of time, the hole will gradually enlarge. The final tear is usually through a small piece of tissue at the bottom of the ear lobe creating what is called a cleft. These tears are often split and are very visible and may be hard to cover with hair. This study was designed to compare long-term results of Plain catgut 5-0 and Vicryl 5-0 suture materials in lobuleplasty of 88 patients from July 2009 to June 2011. We carried out retrospective data analysis of 88 patients (44 U/L + 44 B/L = 132 ears) who undergone lobuleplasty in Department of ENT and HNS, CUSMC & Hospital, Surendranagar, from July 2009 to June 2011 using Plain catgut 5-0 in 66 ears and Vicryl 5-0 suture material in 66 ears of the above-mentioned patients under local anesthesia as day care procedure. Infiltration with 2% xylocaine with 1:1,00,000 epinephrine. Refresh the margin with the No. 11 blade. Undermine anterior and posterior skin edges. Repiercing, if desired by the patient, should not be done through the scar. Patients must be told that placing the earring position adjacent to the cleft repair is likely to minimize the risk for cleft recurrence and should be delayed by 3 months. Repiercing can be done safely by a doctor. The new piercing site should be placed in a nonscarred area of the lobule, midway between the superior edge of the antitragus and the inferior rim of the earlobe. Postoperative comparison between two groups had been done by single blind observer of itching, wound dehiscence, wound infection, scar mark by visual analogue scale (score: 0-10). 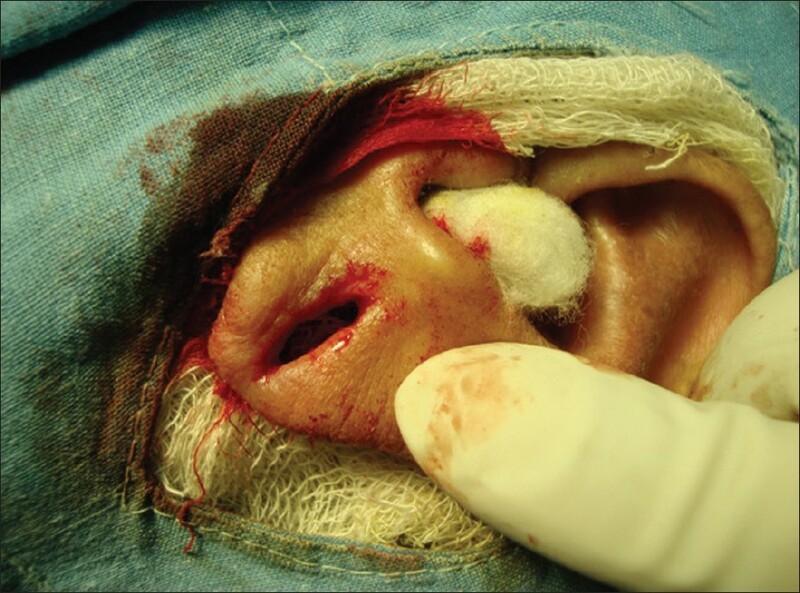 A total of 88 patients with split ear lobule were seen in the ENT OPD from July 2009 to June 2011. Of these, 44 (50%) had unilateral deformity, whereas 44 (50%) had bilateral deformity. All patients in the catgut group and the Vicryl group were followed up on the seventh day and after 3 months for evaluation. No patient had wound infection and dehiscence in any group. Twenty-two ears (33%) were having complained of itching in the catgut group, whereas 11 ears (16.5%) in the Vicryl group, which is statistically significant by the χ2 -test. The average score for the scar mark at a 3-month follow-up for the catgut group was 5 and for the Vicryl group was 8. With respect to wound dehiscence, Gabrielli et al. found a higher risk of dehiscence in patients who are younger, presumably because of the higher level of activity in this age group. Our study revealed a trend that the patients randomized to the Vicryl group preferred the same suture material in the future and found the suture material to be more convenient compared with those in the catgut group. We can only speculate, because of our study design and sample size. Catgut, also known as surgical gut, is a natural absorbable suture which is rarely used today, but was a previous standard in surgery. It is derived from the intestinal submucosa of sheep or the intestinal serosa of cattle. Catgut has fallen out of favour with the advent of new suture materials, because it has poor tensile strength and knot security. It also has high tissue reactivity and is therefore rapidly absorbed. The high tissue reactivity may be due to the fact that while catgut is predominantly composed of collagen, it may also be contaminated with muscle fibers and mucoprotein. The tensile strength of the plain gut is retained for 4 to 5 days and the knot security for 2 weeks, after which the suture undergoes significant proteolytic degradation. In an effort to increase tensile strength retention, catgut is often soaked in chromic salts. While this does increase the resistance to degradation, it varies depending on the chromium salt concentration. , Finally, fast absorbing gut sutures are heated to allow for even more rapid absorption. Such sutures are sometimes used for securing skin grafts. Vicryl was introduced in 1974 as the second synthetic suture material. It is a co-polymer of lactide and glycolide and is coated with a synthetic lubricant. The lubricant allows easier use. It is similar to Dexon in many of its characteristics. Like Dexon, Vicryl comes in a braided configuration and is available in both clear and dyed forms. The tensile strength and knot security of Vicryl is only second, among absorbable sutures, to Dexon. However, the difference is clinically insignificant. Vicryl, like Dexon, is degraded through hydrolysis and therefore yields a lesser tissue reaction. However, Vicryl is absorbed at a faster rate than Dexon. It has been shown that Vicryl is completely hydrolyzed by 60 days postimplantation. On occasion, a reaction to Vicryl may be seen as a 'lump'. This reaction is both rare and usually resolves with time. Vicryl is an excellent option for buried sutures which approximate wound edges until the wound has healed sufficiently to prevent wound dehiscence  . Finally, Vicryl Rapide is irradiated with gamma rays to speed absorption while Vicryl Plus is the only suture impregnated with triclosan for an antibiotic and anti-inflammatory effect. The modern cosmetic surgeons have significantly increased number of suture materials to choose from. When making this decision, it is important to consider the risk of infections, costs, cosmetic results and wound locations. From our study, we conclude that the Vicryl group was having less tissue reaction than the catgut group and appearance of the scar mark was better than the catgut group. Therefore, Vicryl can be preferred as a suture material for lobuleplasty [Figure 1], [Figure 2], [Figure 3] and [Figure 4]. 1. Grisham JE, Zukin DD. Suture selection for the pediatrician. Pediatr Emerg Care 1990;6:301-4. 2. Eilbert JB, McKinney PW, Conn J Jr, Binder P, Beal JM. Polyglycolic acid synthetic absorbable sutures. Am J Surg 1971;121:561-5. 3. Parell GJ, Becker GD. Comparison of absorbable with non-absorbable sutures in closure of facial skin wounds. Arch Facial Plast Surg 2003;5:488-90. 4. Karounis H, Gouin S, Eisman H, Chalut D, Pelletier H, Williams B. A randomized controlled trial comparing long-term cosmetic outcomes of traumatic pediatric lacerations repaired with absorbable plain gut versus non-absorbable nylon sutures. Acad Emerg Med 2004;11:730-5. 5. Holger JS, Wandersee SC, Hale DB. Cosmetic outcomes in facial laceration repaired with tissue-adhesive, absorbable, and non-absorbable sutures. Am J Emerg Med 2004;22:254-7. 6. Gabrielli F, Potenza C, Puddu P, Sera F, Masini C, Abeni D. Suture materials and other factors associated with tissue reactivity, infection, and wound dehiscence among plastic surgery out patients. Plast Reconstr Surg 2001;107:38-45. 7. Bennett RG. Selection of wound closure materials. J Am Acad Dermatol 1988;18:619-37. 8. Moy RL, Waldman B, Hein DW. A review of sutures and suturing techniques. J Dermatol Surg Oncol 1992;18:785-95. 9. Apt L, Costenbader FD, Parks MM, Albert DG. Catgut allergy in eye muscle surgery. I. Correlation of eye reaction and skin test using plain catgut. Arch Ophthalmol 1960;63:30-5. 10. Madsen ET. An experimental and clinical evaluation of surgical suture materials. Surg Gynecol Obstet 1953;97:73-80. 11. Blomstedt B, Jacobsson SI. Experiences with polyglactin 910 (Vicryl) in general surgery. Acta Chir Scand 1977;143:259-63. 12. Conn J Jr, Oyasu R, Welsh M, Beal JM. Vicryl (polyglactin 910) synthetic absorbable sutures. Am J Surg 1974;128:19-23.